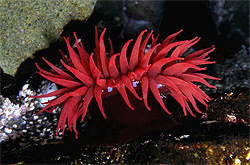 Description: Like all anemones this red blob like organism seen on the low tide with its tentacles retracted is a large POLYP whose feeding tentacles are held up on a cylindrical body called the COLUMN. The BASAL DISC is used to keep anemones fixed to a substrate or it allows them to creep about while others float to a new home. They BREATHE by DIFFUSION through the thin membrane like skin which must be kept moist by mucus. Cnidarians of which this is a member are simple two celled layered organisms with jelly like support tissue called mesoglea between these layers to give them structural support and adaptive shape (hydrostatic skeleton). They exist as two predominant adaptive forms most of which are radially symmetrically. 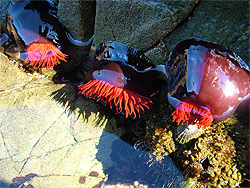 Habitat: In the most part the Red waratah anemone can be seen clumping in the shade, under crevices and dominating in the mid littoral zone of a Rocky Shore. Often the juveniles can be seen in great numbers lining the rock pool fissures. Even smaller juveniles have been photographed living amongst the sea squirts and white tube worm micro communities. This anemone is endemic to Rocky Shores and is part of a community of possibly dozens of different anemones living in the tidal zone. Ecology: Red waratahs catch and immobilize their prey by using their tentacles, each of which contains hundreds of stinging cells called NEMATOCYSTS. These are used to capture and immobilize their prey of plankton and small fish on which they feed. This species has special FIGHTING TENTACLES used to combat nearby anemones belonging to different clones. These tentacles come from white spots called ACONTIA situated at the top of its column. They have few predators but on a high tide are vulnerable to fish and crab predation.